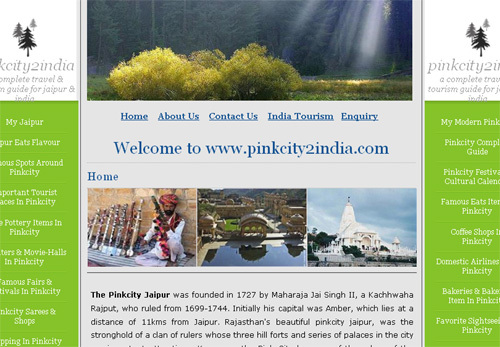 The project Pinkcity2india is a sincere effort to provide authentic Jaipur and India tourism informations, Pinkcity tourism guide, Pinkcity hotels information. We also provide details of pinkcity heritage hotels, pinkcity medium hotels , pinkcity travels information, pinkcity best shopping information and also provide all rajasthan and india tourisms information . This website features a printable guide of the pinkcity & india tour packages suited for everyone . This projects effort to provide authentic Jaipur and India tourism informations, Pinkcity tourism guide, Pinkcity hotels information. We also provide details of pinkcity heritage hotels, pinkcity medium hotels , pinkcity travels information, pinkcity best shopping information and also provide all rajasthan and india tourisms information . This website features a printable guide of the pinkcity & india tour packages suited for everyone . This project describe all the travel and trourism places of Pinkcity. This project also keep the information of all districts of Rajasthan. Its also describe all unidentified and restricted tourism places of india. Its also contains the blogging features. The aim of this project is provide suitable information for foreigners and visitors.